This chart appeared in a recent Economist blog post – I think it’s nicely done. It’s based on a study of U.S. university graduates, and the amount they earn over an extended period. The X-axis is a measure of the quality of the institution: roughly speaking, how easy it is to gain admission. This shows some interesting things – at first glance. First, that Engineers, Computer Scientists and Mathematicians earn more than other fields, which seems only right and natural to me – and second, that the institution at which you study makes very little difference to your final earnings, which seems a bit less plausible. But then I read the article more carefully. 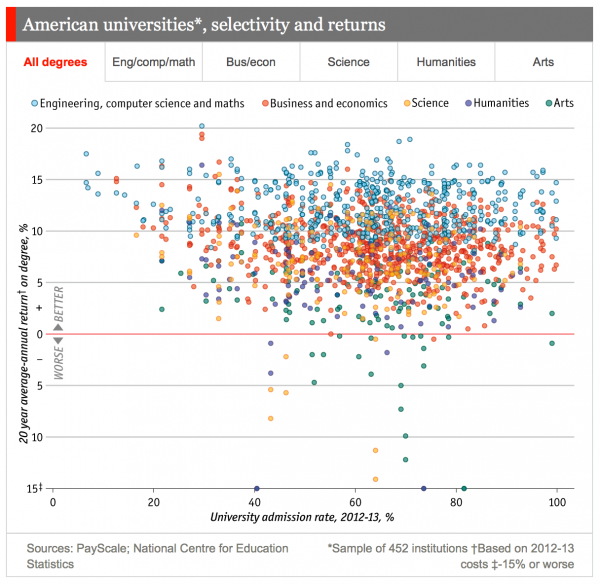 What this is actually plotting on the Y axis is the rate of return on your investment in the degree. If you had put the cost of your education into a savings account and left it for 20 years, what would the equivalent interest rate be? A rather mercenary way of thinking about education, perhaps, but intriguing nonetheless. If you’re studying business, maths or sciences, it’s an exceedingly good investment. If you prefer an arts subject, then you should – and probably will – find other ways of assessing the value of your education. Now, in the States, a degree at Harvard, MIT or Stanford will cost you much more than one at Fred Bloggs College, and you will earn correspondingly more as a result of graduating, to the extent that the annualised return is roughly equivalent. But it would be fascinating to see the same analysis done at British universities, where, for local and EU students at least, the tuition rates are capped and are the same at most institutions. (British students whining about their fees at our top universities should remember that they could easily be paying three times as much in America.) So I imagine the returns here would be rather higher, and the slope rather more pronounced.